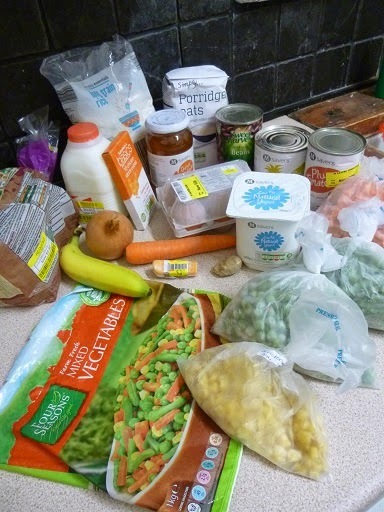 After five days feeding myself on £1 a day, I had about 70p of food left from the original £5 shopping. £5 of food to last 5 days. Well, £4.97, with 3p for salt, pepper, chilli powder, cumin & a tiny bit of oil. 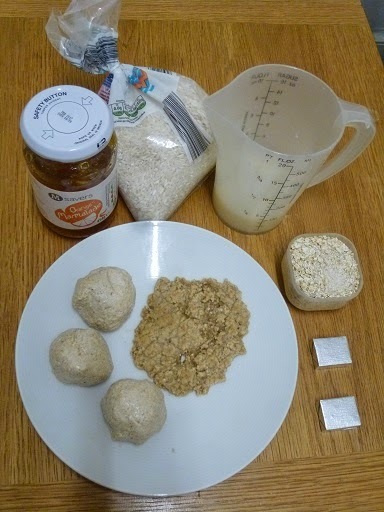 You may be able to distinguish within the sea of beige most of a jar of marmalade, shedloads of rice (aka 630g), about 120 ml of milk, a small pot of porridge oats, a couple of value chicken stock cubes, three oat balls poised to become flatbreads and my first rejected attempt at a flatbread. 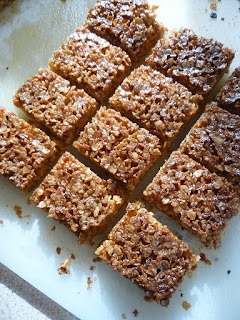 (For further details about my oat based incompetence, see here). Doing Live Below the Line has made me much more aware of avoiding food waste. Even so, I couldn’t quite face the oat flatbreads after 4 days sitting in the fridge, but all the rest of the leftovers will be put to good use. The stock cubes and rice have been added to my storecupboard for future meals. The milk topped up my long-awaited cups of tea and the marmalade tasted even better with butter on my toast. With hordes of friends due for lunch, I also had a go at making marmalade glazed ham. 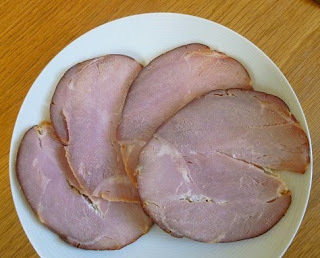 Boiling up a gammon joint to slice tends to be cheaper than buying multiple packs of ham. I’ve used a Mary Berry recipe for mango glazed ham before, involving a carton of mango juice and mango chutney. Lacking either, I used a carton of value orange juice and some of the remaining marmalade. The cooking time depends on the weight of the gammon, so make sure you check the packaging or weigh the joint first. I put the gammon joint in a big saucepan, added a carton of orange juice and topped it up with water until the joint was covered. Bring the liquid up the boil, turn the heat down and then simmer for 20 minutes per 450g plus an extra 20 minutes. Then wrestle the big hot lump of ham out of the saucepan, smear marmalade generously over the outside, use a knife to score lines in the surface and stud it randomly with a few cloves. I think if your joint is a fancy version with thick skin and a layer of fat underneath, you’re meant to peel the skin off before adding marmalade, cloves and scoring the surface, but I didn’t bother. I put it on a baking tray with foil underneath to cut down on washing up, and a circle of foil on the top to protect the lean bit without skin, then bunged it into a hot oven (or under a grill) until it went golden brown, which was about 20 minutes for me. 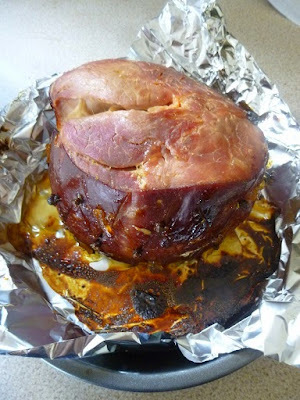 Marmalade glazed ham once sliced. A 1.35kg joint that cost £7 from Morrisons served 8 adults and 9 children with a bit left over, when accompanied with bread and salads, and tasted great. The ham, including the orange juice, a few cloves and some marmalade, cost about 45p a head. That’s the thing with Live Below the Line – the challenge may only last for 5 days, but the impact on your own life lasts for much, much longer. Many thanks to everyone who has sponsored my efforts to feed myself on £1 a day for 5 days on Live Below the Line. I’m incredibly grateful to everyone who’s contributed to UNICEF’s vital work keeping children safe, fed and healthy, especially in the aftermath of the earthquake in Nepal. The campaign remains open right through until the end of June, so there’s still time to donate! Previous Post The day after Live Below the Line – can you guess my first meal? Well done on completing the five days. I found it really tough this year, tougher than all the other years in fact. Love the idea of celebratory flapjacks. I cooked up what was left of my rice and threw it to the chickens …. they enjoyed it far more than I did.